GET COMPLIANT NOW. With the TFL VisTracks Electronic Logging Device for Trucks, get ELD compliant and meet the Dec 18th, 2017 ELD Mandate. California's Intrastate ELD Mandate is set to be effective December 31, 2020. Don't wait for the rush. EASY AND RELIABLE SELF INSTALLATION. The Electronic Logging Device for Trucks from TFL easily plugs into any J1939 vehicle bus. No bluetooth pairing required. One cable goes from the J1939 vehicle bus to the ELD tablet. With the included gooseneck passenger seat rail mount, no drilling is required to firmly secure your ELD tablet. 24/7 SUPPORT HOTLINE. Understanding and keeping up with ELD laws can be overwhelming. As a TFL Electronic Logging Device for Trucks customer, around-the-clock support is just a phone call away. EASY TO USE INTERFACE. The TFL VisTracks Electronic Logging Device for Trucks app is easy to use, requires minimal to no training, with on-screen documenation that helps minimize errors during operation. 3-YEAR WARRANTY. 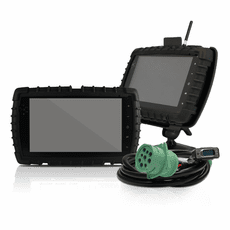 If you experience any hardware issues with your TFL VisTracks Electronic Logging Device for Trucks system during your 3-Year commitment period, we will ship a replacment to minimize your down time. With the increased focus on enforcement of the ELD rules, it is essential that we as a provider offer a compliance center to deal with complex ELD rules, sophisticated interactions between hardware devices on the engine and the ELD app software in the truck cab, and all the situations you as truck drivers may find yourselves confronting. You need someone to call who can help you understand how to modify a log, why you show a violation, why devices are not connecting and hundreds or thousands of other questions. Many in the market are not equipped to handle a support-intensive product such as ELD. The addition of the new VisTracks compliance center will enable you the driver, owner operator, and logistic company the peace of mind in receiving expert help. Compliance center agents are highly trained in VisTracks� ELD products and are conveniently located near one of VisTracks� software development facilities for added support.